Aki Matsuri took place on September 12th and 13th in Bellevue, Washington. 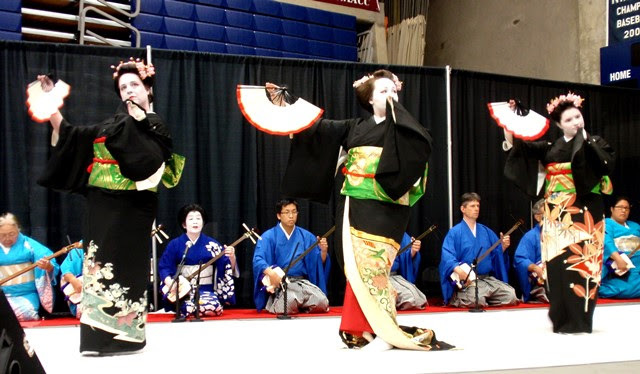 This two day festival spotlights Japanese culture and arts through performances, demonstrations, workshops, and more. 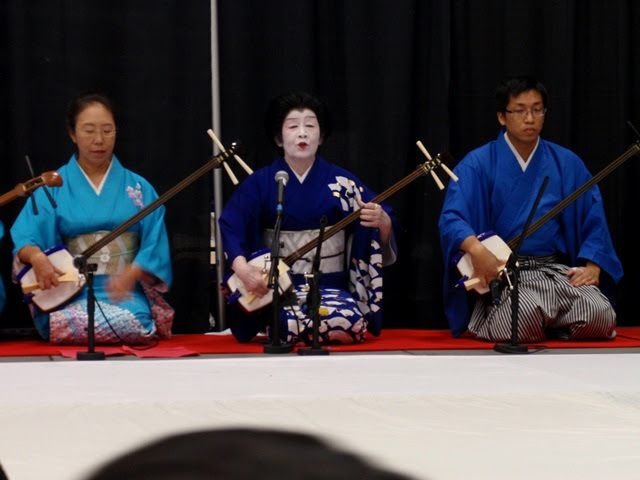 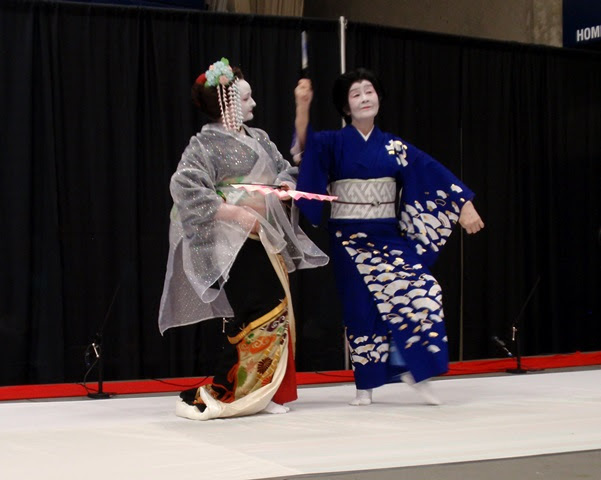 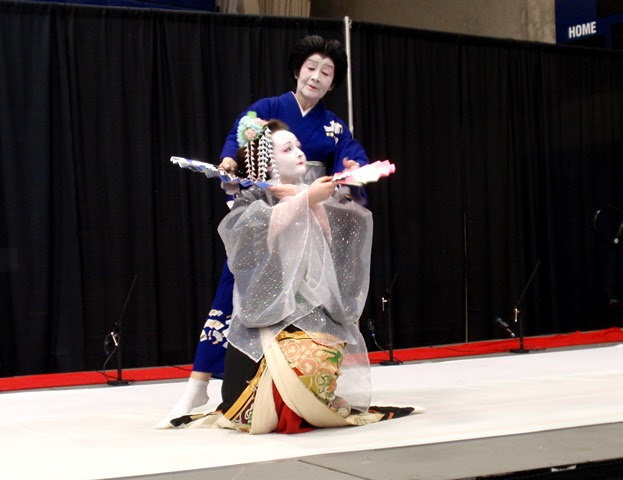 One of the highlights of Aki Matsuri was a performance of traditional Japanese dance and shamisen by Kabuki Academy. 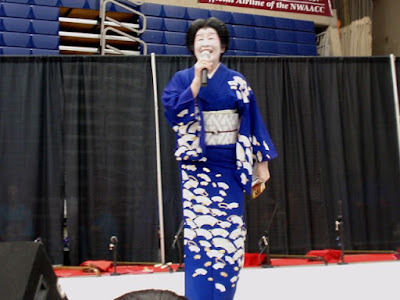 Director Mary Ohno opened the Sunday afternoon performance with a warm greeting and introduction. 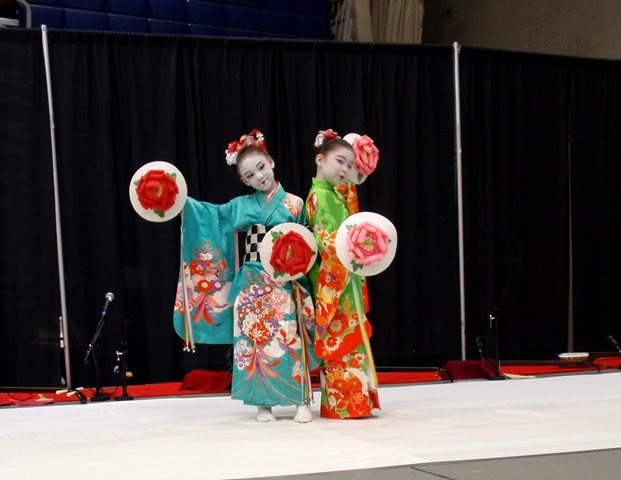 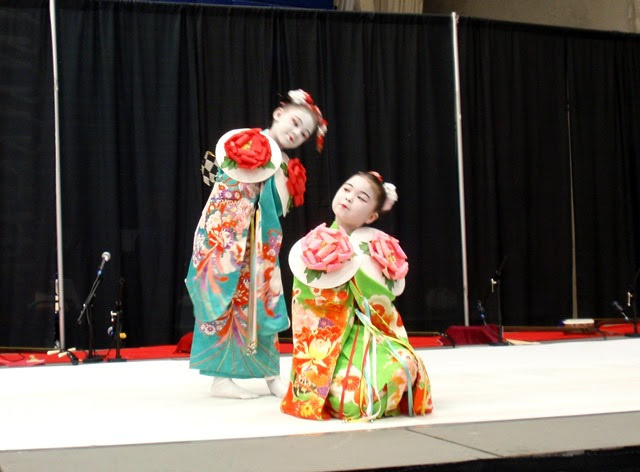 Miya and Mirai, two of Kabuki Academy's youngest members, followed with a performance of Hana Kurabe (Flower Competition). 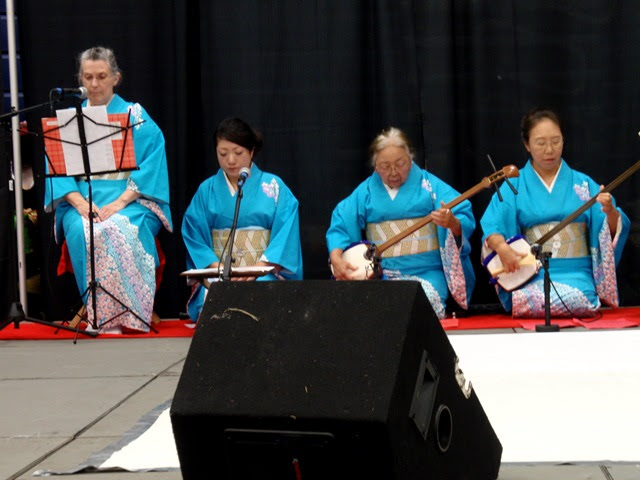 Akina, Hanaka, and Umeka performed the beautiful Ume Nimo Haru (Plum Blossom in Spring) accompanied by live Naga-uta shamisen music. 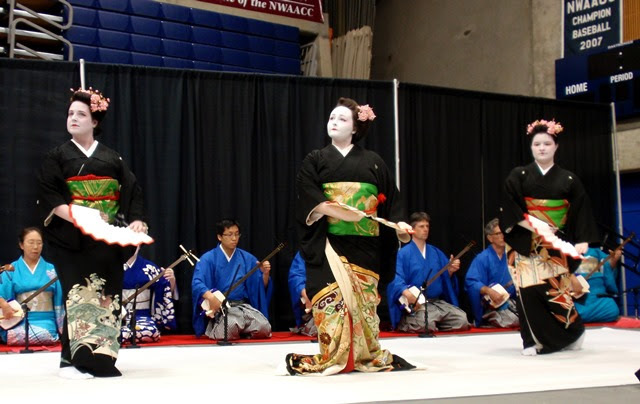 Their dance was followed by a lively shamisen ensemble performance of Kokaji, a musical number from a famous Kabuki dance. 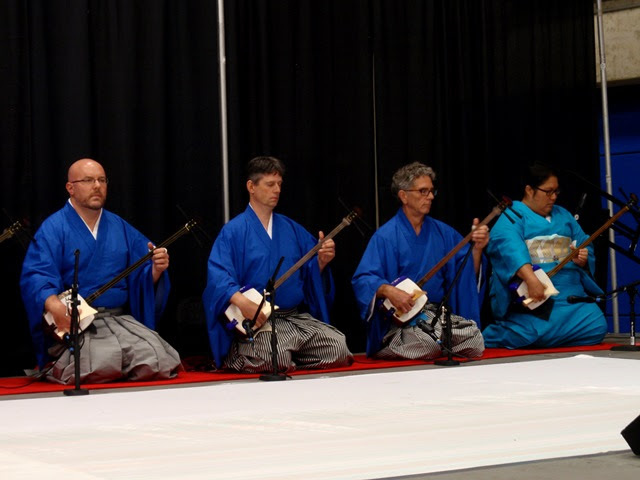 Several of the shamisen musicians have achieved the professional title of Natori (accredited master) from Kine-Ie Kai Institute. Akina and Mary Ohno followed the shamisen performance with Futari Harusame (Spring Rain Duet). This would be a good time to share some of the differences in male and female roles. When the dancer's elbows and toes are turned out, stance is tall, and the kimono collar is pulled up to the back of the neck, this signifies a male role in the dance. When elbows are tucked in, toes pointed slightly in, knees are slightly bent, and the kimono collar is pulled away from the back of the neck (more so for younger maiden roles), this signifies a female role in the dance.